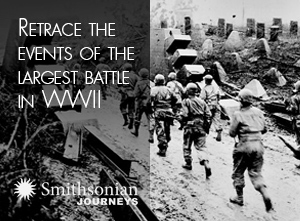 In November 1951, at Patuxent River Naval Air Station in Maryland, Lieutenant Commander Edward “Whitey” Feightner received the call he had been waiting for. On the line was an admiral from Naval Air Training Command, who told him he had been selected for the Navy’s flight demonstration squadron, which would eventually adopt the name the Blue Angels (after a Manhattan nightclub). In these silent clips, an F-7U Cutlass bounces onto the USS Hancock and its gangly nose strut compresses to absorb the energy. Another Cutlass snags the net. In the final sequence, from July 14, 1955, an F7U-3 lands short; the only fatality was pilot LCDR Jay Alkire of the VF-124 Stingrays. Feightner had just one question: What airplane would the team fly? 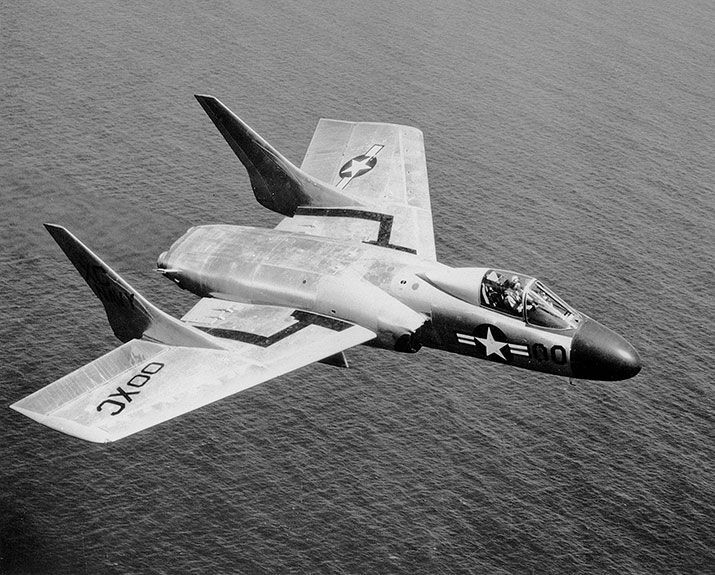 Conceived in part from swept-wing, tailless research recovered from the German manufacturer Arado after World War II, the Chance Vought F7U Cutlass was a radical departure from not only every other naval aircraft, but just about anything in the air at that time. It had no tail. Its vast, swept wings (with an area totaling 496 square feet) were nearly as long from leading to trailing edge as they were from root to tip. Its monster nosegear—the first to be fully steerable—placed the pilot 14 feet in the air, and during carrier landings tended to collapse. It also had the first hydraulic system at high pressure: 3,000 pounds per square inch—twice the pressure of the systems on other Navy jets—and all-hydraulic flight controls with built-in “artificial feel,” which restored control-surface feedback to the pilot. Besides being exotic, the Cutlass was burdened with immature systems. Its hydraulic system constantly leaked and lost pressure, and its engines, like those on most early jets, failed to produce the power expected of them. 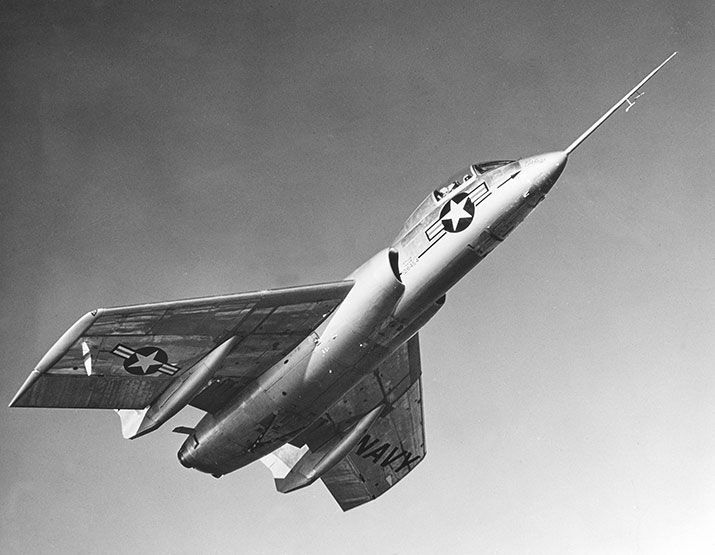 In the summer of 1951, Feightner began putting the F7U-1 through its paces. When the Blue Angels call came, he had already determined that the Cutlass was an airframe to be reckoned with. Just not by him. 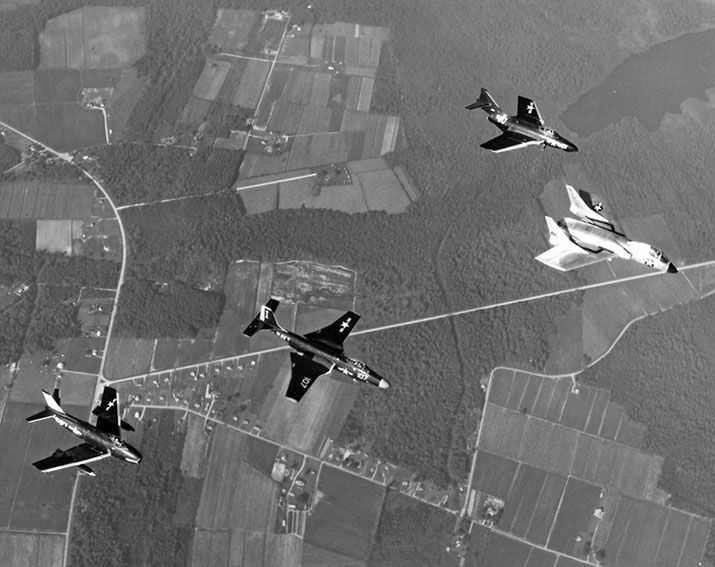 The team went with Grumman F9F Panthers instead, and relegated the Cutlass F7U-1 to the two soloists, Feightner and Lieutenant Mac MacKnight. While the Panthers were grounded for fuel control problems in the spring of 1952, Feightner, in a blue and gold Cutlass, made his Blue Angels airshow debut, flying a one-man show for VIPs in Pensacola, Florida. “I rolled down there, hit the afterburner, and headed straight up,” he says. “We didn’t have any other airplane that could do that in those days. I just started to climb, then I lost the hydraulics. You couldn’t eject until you got to 1,500 feet, and I topped out at 1,100, then headed straight down. I have the stick [full aft] and nothing is happening. The ground is getting bigger and all of a sudden everything hooks up again and the airplane goes nur-ooop. So now I’m flying—but there is a row of trees at the end of the runway. I couldn’t get over them so I just picked out a space between two trees and carved a hole through them.” Streaming hydraulic fluid and wood pulp, Feightner wrestled the Cutlass onto the runway and even managed to taxi up to the crowd. Feightner and MacKnight flew the Cutlasses almost daily. They endured hydraulic system and landing gear failures, inflight engine fires, and, on one occasion, pieces of landing gear doors falling onto a grandstand, miraculously missing everyone. By June, the Panthers had returned to flight, and the Cutlass solos were cut. 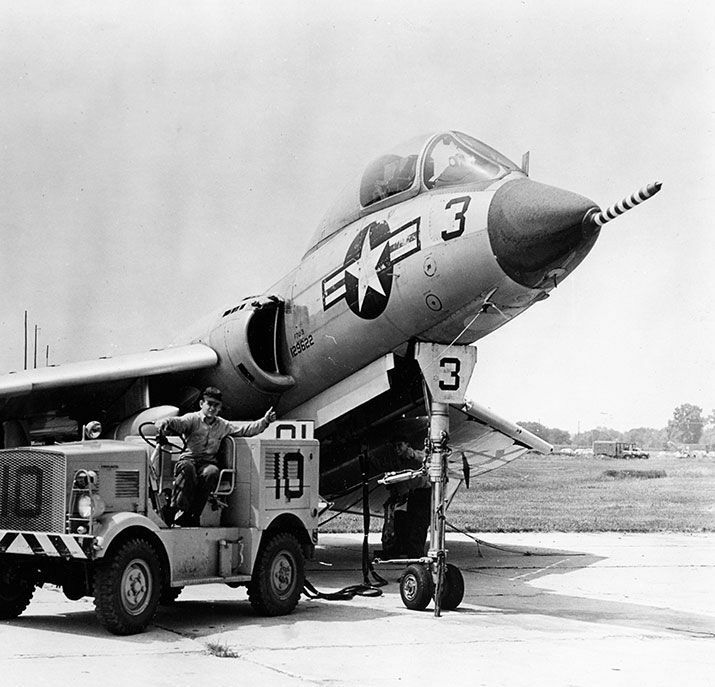 None of the 14 F7U-1s built between 1950 and ’52 made it to squadron service. But there was a new F7U in the offing. Improvements included new engines, a longer, thicker, and sturdier airframe almost a third larger than the original, and additional access panels for easier maintenance. On December 20, 1951, the F7U-3 made its first flight. But in some respects, the F7U-3 showed promise. Cutlass drivers found a number of things to praise about their new ride: It was a stable bombing platform, nimble, fun to fly, and, with its strengthened airframe, almost unbreakable. Feightner loved the fighter’s roll rate, which at 570 degrees a second was three times that of most production jets. The F7U became a staple in hobby shops. Oldsmobile appropriated the name for a 1954 sports coupe. 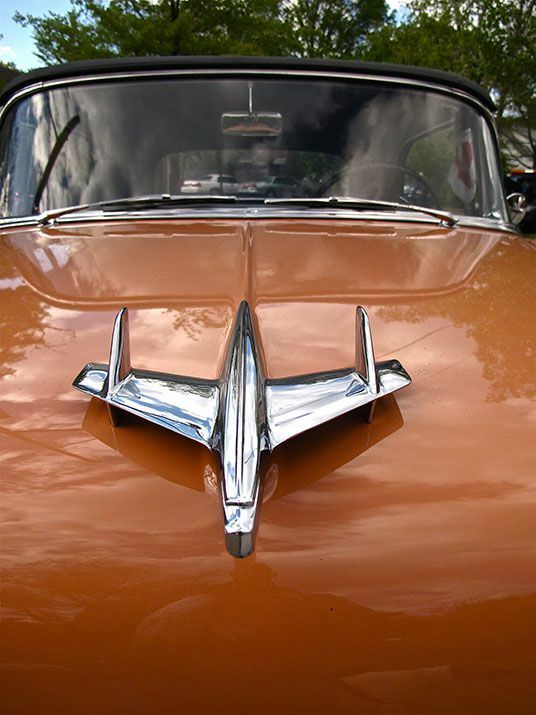 The Cutlass also provided the inspiration for the hood ornament on the 1955 and ’56 Chevrolet Bel Air. All high-performance jets of the era—the North American FJ-1 Fury, the Lockheed P-80 Shooting Star, the McDonnell F2H-2 Banshee—had their share of unique incidents and accidents, but the sheer number of high-profile Cutlass misfortunes was tough to beat. Like the time Vought test pilot Paul Thayer ejected from a flaming prototype in front of an airshow crowd on July 7, 1950. Or when Lieutenant Floyd Nugent ejected on July 26, 1954, only to watch the Cutlass, loaded with 2.75-inch rockets, fly serenely on, orbiting San Diego’s North Island and the Hotel Del Coronado for almost 30 minutes before ditching near the shore. When the left engine on Lieutenant Commander Paul Harwell’s Cutlass caught fire moments after takeoff on May 30, 1955, Harwell ejected and never set foot in the F7U again—giving him more time in a Cutlass parachute than in the actual aircraft. 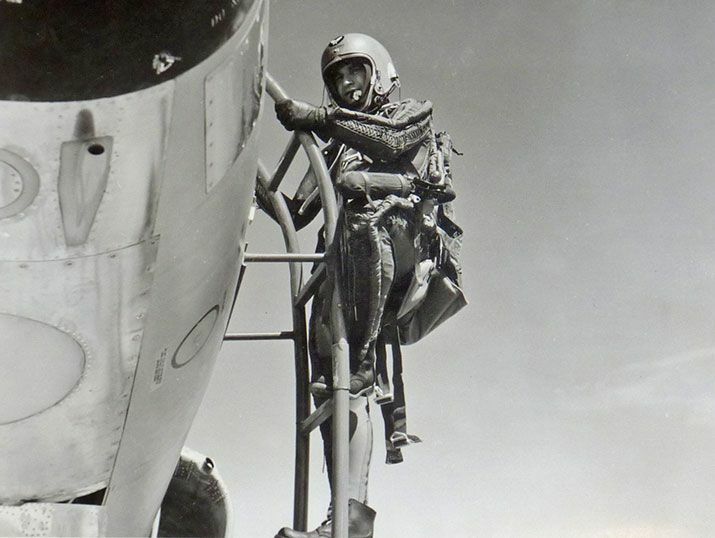 An electrical failure forced Tom Quillin to abort a training mission and declare an emergency. Quillin returned to base only to learn he was number three in the emergency landing pattern, behind two of the three other Cutlasses he took off with. On December 11, 1954, during a low-altitude, high-speed pass before thousands of onlookers at the christening of the USS Forrestal at Newport News, Virginia, Lieutenant J.W. 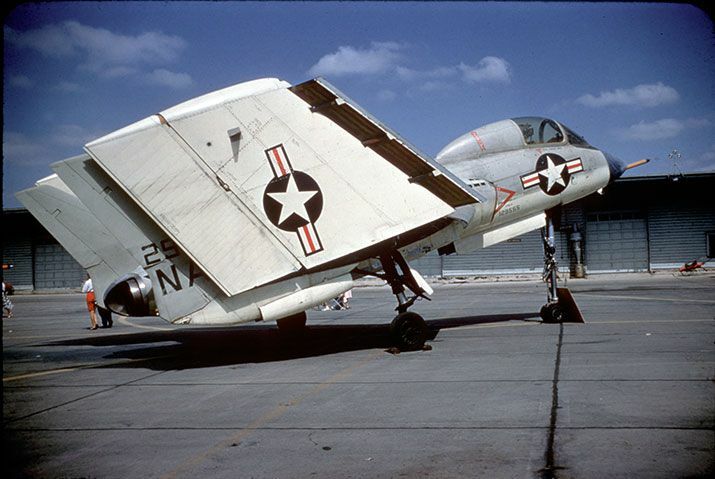 Hood’s F7U-3 suffered a wing-locking mechanism malfunction. The airframe came apart, an engine blew up, and Hood was killed when he was catapulted into the water. On July 14, 1955, before the first deployment of a Cutlass squadron at sea, an F7U-3M Cutlass pilot flying carrier qualifications off the coast of San Diego was waved off as too low on approach to the USS Hancock. In a sequence shot by Navy camera crews, the Cutlass, flown by Lieutenant Commander Jay Alkire, is descending, though its nose is pointing skyward. 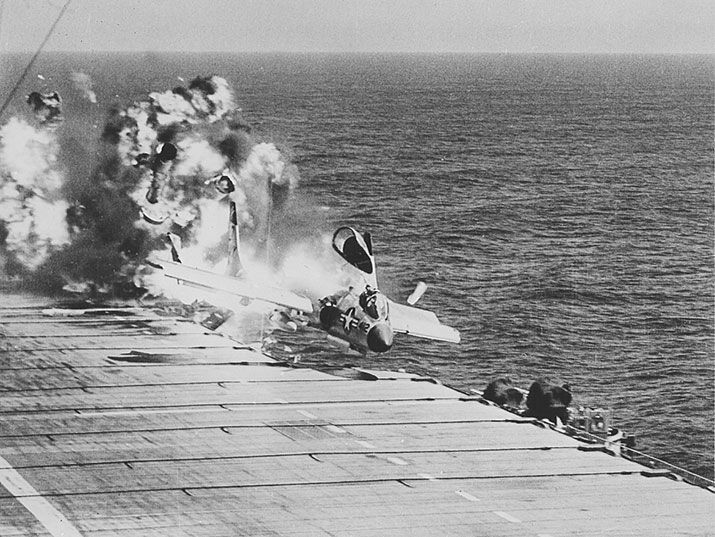 The landing signal officer sprints across the flight deck only moments before the Cutlass hits the carrier, breaks apart, and falls over the side as a fireball consumes the tail end of the ship. Alkire was killed. The F7U-3 shared a design flaw with the F7U-1: two anemic Westinghouse jet engines. The company promised Vought and the Navy it could build an engine for the -3 that would generate 10,000 pounds of thrust in afterburner. By the time the J-46-WE-8A was delivered, Westinghouse had dropped the estimate by 10 percent. Later evaluations indicated it could put out no more than 6,100 pounds. And no existing engine would fit the Cutlass’ airframe. Vought engineers, concerned about the kickback load on the nose landing gear actuator and mounting structure, added small turbines, powered by engine bleed air, to pre-spin tire on the nosegear tires to 90 mph. But the nosegear strut continued to fail, despite efforts to reinforce the structure by 30 percent. A weak drag link brace tended to give out during landing. The USS Hancock, like most aircraft carriers of the day, had a straight deck (the switch to angled decks began in the mid-1950s). 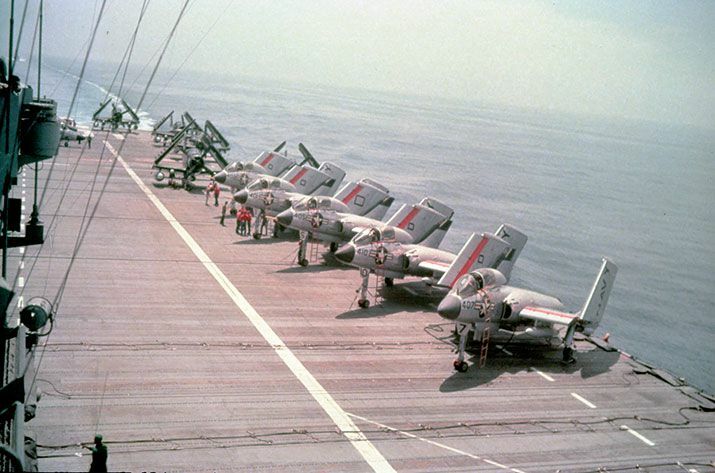 To come to a stop before running out of deck or into the aircraft parked at its far end, pilots were required to grab an arresting wire with the aircraft’s tailhook or rely on a series of canvas safety nets and metal cables. On November 4, 1955, when Lieutenant George Milliard tried to land, the tailhook on his Cutlass floated over all 12 arresting wires. Too low and slow to go around, Milliard went into the barrier, where the nosegear failed. The strut drove up into the cockpit and into the base of the ejection seat, triggering the ejection seat firing mechanism and knocking off the canopy. Milliard was launched 200 feet forward. He hit the tail of a Douglas A-1 Skyraider and later died of his injuries. “The skippers never really liked it because it took up a lot of space and they never could really do anything with the airplane,” says Feightner. “The Cutlass was pretty short-legged.” Soon after launching from a carrier, the pilots had to begin thinking about where to put the thing down. “They used to say if you put a 3,000-pound bomb on it, you couldn’t go far enough to keep from blowing up both you and the ship,” Feightner says. Then there was the post-stall gyration. On January 11, 1955, Lieutenant J.D. Lindsay was at 28,000 feet when his maneuvering brought him close to a stall. Suddenly the F7U-3 went head over heels. Violently thrown about the cabin, Lindsay ejected and survived. 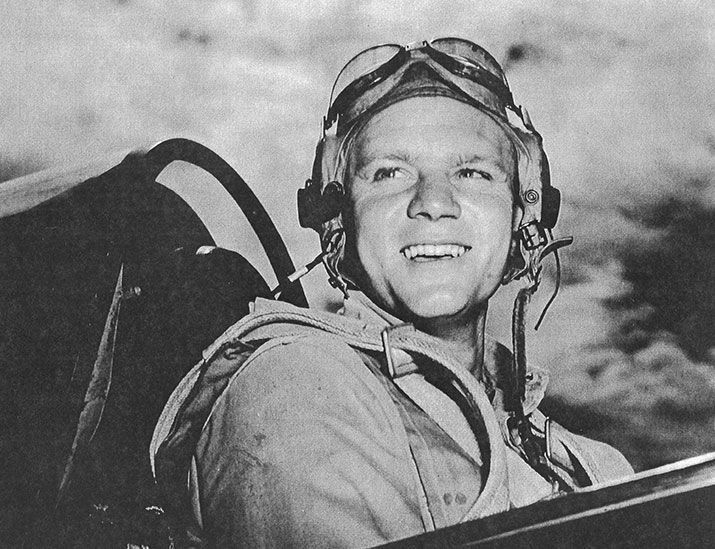 Nine days later, Lieutenant Commander Bud Sickel investigated the flight regime that had caused the loss of Lindsey’s Cutlass. After tumbling 18,000 feet and trying every recovery technique he could think of, Sickel ejected. When Lieutenant Morrey Loso found himself in a similar situation, he let go of the stick and fumbled for the overhead ejection handles. To his astonishment, the Cutlass leveled off. 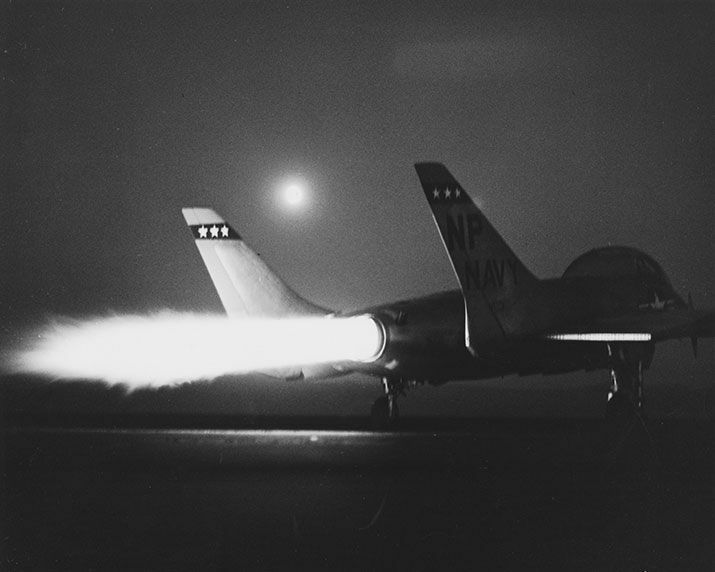 Subsequent wind tunnel testing confirmed that the usual rules for exiting uncontrolled flight didn’t apply to the Cutlass. Just a little aft pressure on the stick, or let it go entirely: With enough altitude, the airplane would likely recover on its own. But by then, the Cutlass’ reputation was such that Vice Admiral Harold M. “Beauty” Martin, commander, air force of the U.S. Pacific Fleet, began replacing his squadrons’ Cutlasses with Grumman F9F-8 Cougars. 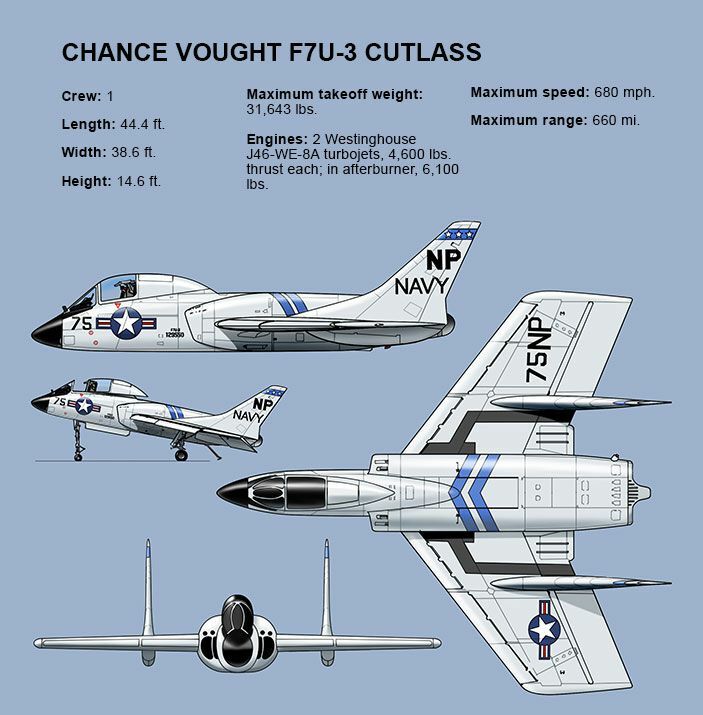 Even after Martin started his Cutlass purge, Chance Vought was still cranking out F7Us. Along with 180 F7U-3s, Vought built 98 -3Ms, the first aircraft in Navy inventory capable of carrying the Sparrow air-to-air missile. Vought also built a dozen -3P photo-reconnaissance Cutlasses, and tried to interest the Navy in 250 of the ground attack version, the A2U-1 (the Navy ordered them, then cancelled before production began). 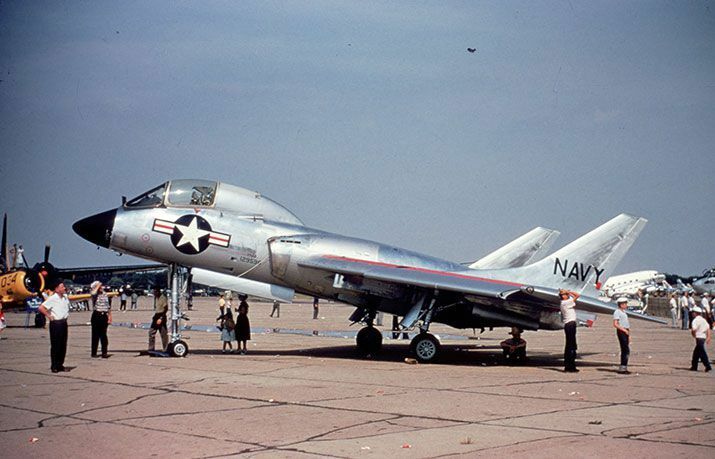 Even those who liked the airplane admit it had its shortcomings, but maintain that if the Navy had spent the time and money to adequately address them as it had for airplanes like the Vought F-8 Crusader or the Douglas A-4 Skyhawk, the F7U could have been a sweeter ride. Supporters say it was a necessary step in the advancement of naval aviation, and that while the numbers were bad, so were the numbers of just about everything involving jet fighters and aircraft carriers in the early to mid-1950s. Ultimately, between June 1954 and December 1956, 13 fleet squadrons received Cutlasses. In 1957, Chance Vought analyzed major F7U-3 accidents. At 55,000 hours cumulative flight time, 78 accidents, and one-quarter of airframes lost, the Cutlass had the highest accident rate of all Navy swept-wing fighters. DC Agle has flown a Cutlass. To this day his mother has no idea what happened to her car’s transmission and rear axle.